The Fiskars Softouch tools make it a breeze to dig, cultivate and transplant in the garden with comfort and durability. In order to reduce hand stress and fatigue, each soft, contoured handle has a natural fit to your hand and encourages a neutral wrist position. Compared with many other garden tools, the flat end pad of each handle features a smart way to generate more leverage. And cast-aluminum heads are rust-resist for lasting value and won’t snap off while you’re digging. So you don’t have to worry when dig in tough soil area. In addition, the handles include hang holes for convenient storage. 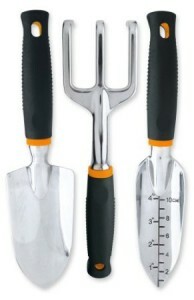 The 3-Piece Softouch Garden Tool Set includes a trowel, cultivator and the transplanter. The trowel is great for digging when planting, taking up plants, turning up earth and more. The cultivator can be used to loosen soil, remove weeds and aerate soil with ease. And the transplanter features gradation marks to make transplanting small plants and flowers a breeze. Trowel for digging when planting, taking up plants, turning up the earth and more; cultivator for loosening soil, removing weeds and aerating the soil with ease; transplanter for making transplanting small plants and flowers a breeze.